As a member of the Firm’s Research and Writing department, Aaron works closely with the other members of FBBC’s team, contributing to the Firm’s careful planning and strategy at all stages of litigation. Since joining the Firm, Aaron has worked extensively on cases involving business litigation, and has experience in class actions, lender liability, and contract disputes, among others. Aaron graduated with honors from York College of Pennsylvania in 2005, earning a Bachelor’s degree in philosophy. Before entering law school in 2009, Aaron studied philosophy at the graduate level at Michigan State University, focusing on political and legal theory. 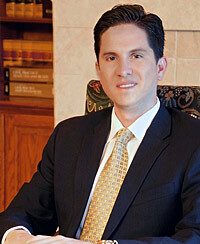 Aaron graduated from University of San Diego Law School in 2012. During his time there, Aaron focused on complex civil litigation, and placed first in USD’s 2011 American Association for Justice mock trial competition. Aaron is licensed to practice law in the state courts of California and in the Central District of California, and is a member of both the Santa Barbara and Los Angeles County Bar Associations.